I can remember like it was yesterday, I was in the 6th grade and was terrified to go to sleep. I had seen a movie on TV about the end of the world & the ‘rapture’ and as a child I was so afraid I would get “left behind”. The whole idea of Messiah coming back secretly to gather His church, taking us to Heaven while we watched the utter destruction of the earth and all of those who had not accepted Him below never really sat well with me, BUT….it is what we were taught was Biblical truth. It is what my mom believed and probably her mom and even her mom. The Pre-Tribulation rapture “theory” is what the majority of Christian’s seem to believe is true. Even those who are not believers in Messiah would probably tell you what is predicted to happen based on the popular “Left Behind” series of books and movies. Because we have become so lukewarm and apostasy abounds, even in the “Christian” community we tend not question anything our Pastor teaches us, we don’t study for ourselves. Sure, we may read a few scriptures but do we really dig in and study to show ourselves approved unto The Father? In most cases, I have found that unless I am willing to accept what I believe may be completely false and re-learn what the Bible REALLY has to say, I will continue to live my life in complete deception from the evil one. And let’s face it, that is how most of Christianity lives today. The Pre-tribulation rapture theory is probably one of the most wide-spread and dangerous deceptions fabricated by the enemy of our souls in the 16th century through a Jesuit named Francisco Ribera. Hmm….the 16th century, wonder what those followers of Messiah who lived throughout the earlier centuries believed? Like the reformers who became martyrs for their faith and others whose names we recognize as great Bible scholars and theologians. The majority of them held the Historic Prophecy Fulfillment view and we find that documented in their books and commentaries. What this view says is that prophecy began to be fulfilled soon after John completed the book of Revelation and has continued to be fulfilled through historical world events since then. Prophecy being fulfilled throughout history…what a concept! What this view also says is that the Roman Catholic Church is the enemy of Messiah (Anti-Christ), the Sea Beast of Revelation 13, Mystery Babylon and the Mother of Harlots of Revelation 17. This is crucial to understand in order to see why the ‘cover-up’ with the false pre-tribulation rapture was fabricated by the Jesuits. It was in fact created to deflect attention away from the Roman Catholic Church as the Anti-Christ. Because I like to include a personal perspective in my posts, I’ll give a summary of how I came to believe this view to be truth. In 2013, in the midst of our Awakening the Holy Spirit led me to information which showed me the pre-trib rapture was false, just a huge clever deception. So, in our search for truth the first stop along the way was the “Post-Trib” rapture view. I can honestly say, this was a very confusing time for us. Remember, realizing almost all you have believed is a lie is not an easy discovery. With this new found information, I began to study the book of Daniel for the first time, these 70 weeks that now became so important were completely new to me. As a previous “Pre-Triber”, I knew nothing of the the 70th week that post-trib says had yet to be fulfilled. According to this new Post-Trib view, we would see the Anti-Christ stand in the temple and perform the Abomination of Desolation. These things had never crossed my mind, after all I’d always believed we would be “Outta Here!” by then. I mean, you know the scripture…God has not appointed us to wrath, so how could He possibly leave us here during that time? These things were mind boggling as I began to realize my world was once again about to be turned upside down. I learned that we were NOT going to be raptured out of here before the end, but now trying to find the truth of when that end is supposed to be was challenging. As we continued awakening, we of course continued asking for Elohim to show us truth through the guidance of the Holy Spirit. We would pray every night that no matter what, show us…prepare us for what we may find and remove any road blocks in our mind placed there by the enemy. As we knew well by this point, Elohim always delivers when you are seeking truth and submitting to His will. In 2014, I was led to the website I have linked throughout this post (Christianity Beliefs) when actually studying truth about another subject, the nation of Israel. As I began reading the wealth of information here, I saw a yet different view of prophecy fulfillment than the post-trib, which I had really just settled in my mind was correct. I will admit, at first I was fearful. Here is yet another view of eschatology to consider and what all did this really mean? I began to see how prophecy had been fulfilled throughout history and the dates and facts where there to prove it. After a short time of study, I began to see that this view actually answered some of the questions I had with the pre and post-trib camps of thought. It seemed all of the gaps I could not fill with the others, was being filled with this new end times view that I had never before heard of. Then, the enemy began to work on my mind and brought much fear with this new view. I began to question myself and what I was reading, I even refused to believe it at first. I walked away for a few months and turned my attention to other topics of study. Because we know Elohim is always faithful to show us what we are seeking, He led me straight back to the Historic view and this time the fear was removed. On my second round of praying/studying the historic fulfillment of prophecy, I began to see how it all clicked together and it just made sense. One of the biggest turning points for me was the fact that Elohim gave a prophecy to Daniel in Chapter 9:24 that would be completed in Seventy Weeks. To put it simply, if Elohim gives a time limit/line then you better believe the prophecy will be fulfilled in that time for He is not a man that He should lie (Num 23:19). Now, why this is so crucial is because the other two views of eschatology I had believed say that we are still waiting on Daniel’s 70th week (in prophecy = 7 actual years) to take place in the future, which is said to be the Tribulation. 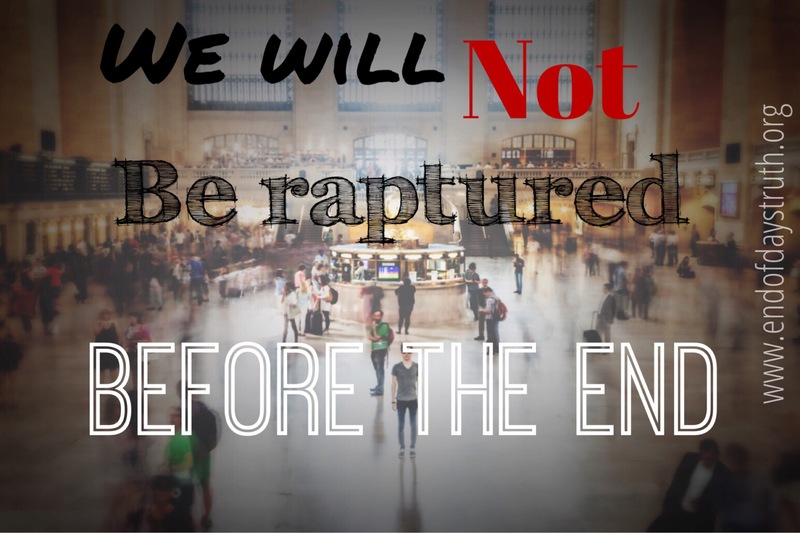 The pre-trib camp says the church will be raptured and then the 7 year tribulation begins. The post-trib camp says that the seven years of tribulation begin when the Anti-Christ signs a peace treaty (although there are dozens of speculations with whom), then 3.5 yrs into the tribulation the Anti-Christ completes the abomination of desolation and at that point we would know we have only 3.5 yrs left until Messiah returns for His church. But again friends, there is NO gap in the Holy Scriptures. It does not say that 69 of the prophetic weeks will be complete on time and then we will have a gap of over 2,000 years before the 70th and final week commences. This alone was enough to make me see how ludicrous the other views were and how many have fallen victim to the deception, in order to have us waiting on prophecy fulfillment that by historical fact has already been fulfilled. The Historic view of Eschatology which I believe to be correct, says the 70th week was completed in 34 A.D. when Stephen was stoned to death signifying the final rejection of Messiah’s new covenant by the Jewish leaders. As of today, we are currently waiting on the 7th and final bowl of Revelation 16 to be poured out. All other seals, trumpets, bowls have been fulfilled which is contrary to the other views. It would be crazy for me to try and explain all of the details of the fulfilled prophecy and what is to come when there are already resources out there that fully explain all of these things layer by layer. As well as quotes and commentaries by respected Bible scholars who show this Historical view of Daniel’s 70 weeks and Revelation prophecies was the view they held in the early centuries. There are many other topics I will write about regarding the widespread deception by the evil one. This is truly a very high level overview, but I wanted to use this particular post as just a starting point and reference to share specifically about the LIE of a future 70th week, future one man Anti-Christ, pre-trib/post-trib rapture! I have linked certain pages below so that you can begin to search and study for yourself. When you begin to study, you may see other truths that surprise you, it seems to happen that way. The Holy Spirit will guide you through it all if you are willing to have open eyes and lay aside all of the previous training, teachings, thoughts that you have regarding these things. Below are just some of the recommended links, books and websites for further study of the Historic view of Eschatology from great men of the faith through the centuries and today. May Yah bless you as you seek the truth!